R Kelly is a songwriter, record producer, and singer from Chicago. He gained his recognition when he released his debut album ‘Born Into the 90’s’. He pursued his rapping from there and today he is known for being one of the best singers and songwriters of all time with songs including likes of “I Believe I Can Fly” and “Ignition”. Recent news came to light when R. Kelly released a new 19-minute song, explaining how he was broke. Hence, his net worth has been adjusted from $150 million to just $1 million. R Kelly’s net worth is estimated to be roughly $1 million dollars as of 2019, and after numerous law suits, complications, allegations, and even the “Surviving R Kelly” series; his net worth has dropped significantly. Robert Sylvester Kelly was born on January 8, 1967, in Chicago. Kelly’s mother, Joanne, was a singer. Kelly’s father was absent throughout his son’s life, so his mother raised him and his three siblings alone. Kelly was often sexually abused by a woman, which he wrote his autobiography about. Kelly entered Kenwood Academy where he performed a song by Stevie Wonder, and after that, he started to perform on the streets of Chicago. He formed a group with his friends “MGM” (Musically Gifted Men” in 1989. MGM recorded and released their debut single”Why You Wanna Play With Me”. Kelly signed with Jive Records in 1991 and pursued his singing career after that. Kelly started his singing career in 1991, after his years of performance in the streets of Chicago. He signed a contract with Jive Records, and the following year he released his debut album Born Into The 90’s. His debut album turned out to be a big success with the hits “Slow Dance (Hey Mr. Dj)” and Honey Love. In 1993 he scored his first No.1 single on the pop charts, Bump N’ Grind. After his mother’s death, he continued to live up to his nickname “Prince of Pillowtalk”. He lauded as the king of R&B, and in 1996 he released a superhit “I Believe I Can Fly” that earned him three Grammy awards in 1997. Kelly has collaborated with worldwide artists including the likes of Whitney Houston, Michael Jackson, and Gladys Knight. He remained as the king of R&B in the 90’s. In 1998 he released his album “R” where he featured a duet with Celine Dion entitled “I’m Your Angel” which sold more than 7 million copies. Kelly and Sean “Puffy” Combs made the charts with “Satisfy You” (1999) and two years later, Kelly joined the rap king Jay-Z to create another top hit “Fiesta”. In 2012 he released “Write Me Back” which followed the footsteps of stars like Teddy Pendergrass and Marvin Gaye. Since then, Kelly has pursued to make new music. He was known for being the R&B king during the 90’s and he has sold over millions of copies of his music. As of 2019, R Kelly’s net worth is $1 million. View our larger collection of the best R Kelly quotes! With R Kelly’s net worth at $1 million, he has nowhere near the amount of money he once had. There has been so much trouble caused during his success, that today; R Kelly is down to his last million. 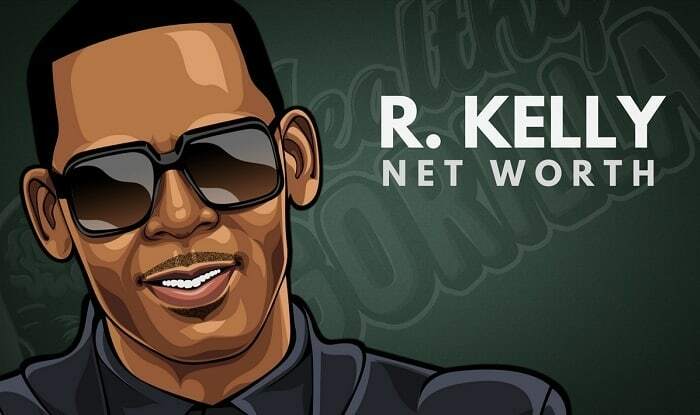 What do you think about R Kelly’s net worth? Leave a comment below. He also has written and produce music for other celebrities that was hits. I think that if he didn’t have so many lawsuits against him, hen would be worth more money. Praying for R. Kelly. Praying for you, bro. I know how you feel. R Kelly Net worth $1 million , please? I’m so sad for him and I really feel sorry for him that he has lost all of his money, I think they need to back up off of him.